I want to invite you to take the 90-Day Challenge! 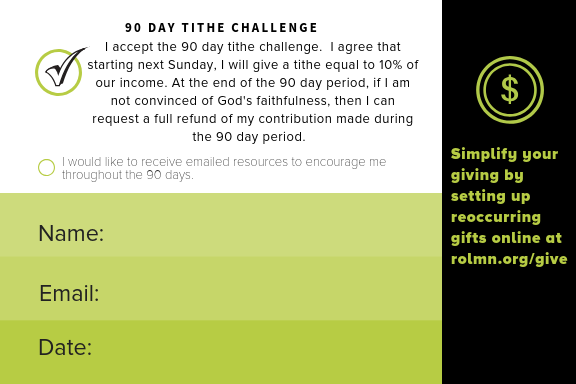 It’s your opportunity to partner with us by agreeing to tithe (10 percent of your income) to River of Life for 90 days. In Malachi, God promises to be faithful in love and goodness to us when we are faithful in returning His tithe. So, we’re asking you to agree to tithe for three-months; 90 days. As you can see in Malachi, God invites us to test him in this. “Bring the whole tithe into the storehouse, that there may be food in my house. “Test me in this,” says the LORD Almighty, “and see if I will not throw open the floodgates of heaven and pour out so much blessing that there will not be room enough to store it,” (Malachi 3:10). Tithing isn’t about our money, it’s about our relationship with God. Bringing the first 10 percent of our income to God can feel overwhelming, even impossible. Especially at this time of year when there are gifts to buy, bills to pay, and charities in need, but Malachi tells us that when we tithe and bring back to God what is already his, he will bless us. Tithing is about learning to trust that God will keep that promise. Tithing is about training our heart to trust God at His Word. Countless people experience God’s blessings when they tithe, but often the first step is the hardest one to take. “But how can I give when my budget is already so tight?” I have asked myself that question many times over the years. Wondering how there will be enough at the end of the month to cover all my need. I have also learned (at times through tithing) that Gods’ ways do not always make sense to my small mind. He is a good Father who cares for me. He is a faithful Father who provides for me. And He is a creative Father who provides in ways I could never think or imagine until He shows me. “He continued this subject with his disciples. ‘Don’t fuss about what’s on the table at mealtimes or if the clothes in your closet are in fashion. There is far more to your inner life than the food you put in your stomach, more to your outer appearance than the clothes you hang on your body. Look at the ravens, free and unfettered, not tied down to a job description, carefree in the care of God. And you count far more,'” (Luke 12:24). Tithing is another way to worship God — to honor Him as your provider and remind yourself that all your resources belong to Him and are provided through His grace. In giving that first 10 percent of your income, you begin to honor God with your finances. Through this we are reminded of our dependence on Him in both plenty and want. In good times, we remember that He is the source of all blessings and by tithing we show our gratitude. In difficult times, we remember His faithfulness and it deepens our need and trust in God to provide for us. So, I invite you to take the 90-day challenge. Pray and ask God to guide you in your finances; invite him to be a part of this area of your life. I am confident that it will change your relationship with God in new and profound ways. You can fill out the form, give for three months, and test God’s promise. If at the end of the three months, you haven’t seen the benefits of being a cheerful giver, we will return your tithe. It’s bold but we know God is ever faithful. 1. During the month of December, fill out a 90-day challenge card. Just put your name, email address, and the date you want to start tithing. 2. Turn it in to the offering or at the welcome center. We’ll send you encouragement and tips via email if you request. 3. Set up a reoccurring gift through our website or give on Sunday mornings.